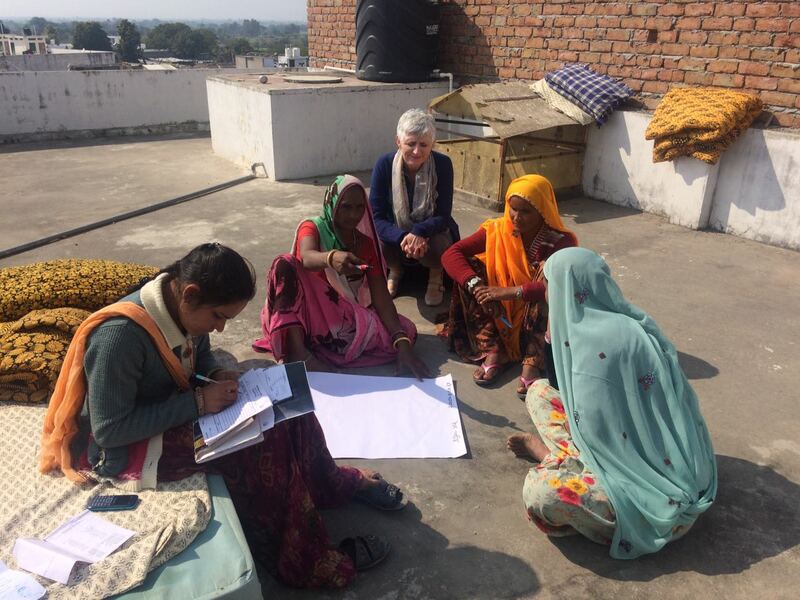 On my first assignment for Women on Wings I had the opportunity to work with two social enterprises that create job opportunities for women in rural India. This was my first visit to India and what an experience it has been! The colors, the people, the hustle and bustle of life were overwhelming. I was struck by the hospitality and kindness of all the people I’ve met during my trip. My trip started on 29th of January, when I arrived at Lutyens Guesthouse in Delhi. I immediately felt at home. That morning I met Ronald van het Hof and Ineke Bezembinder from Women on Wings with whom I discussed the assignments. And we enjoyed a lovely lunch at Khan Market. On Monday morning I met Supriya Kapoor, Senior Business Consultant at Women on Wings and my companion on the assignments. The purpose of both assignments was taking the teams on an HR journey with the aim to realize organizational development. Our first visit was to Grameen Sahara in the city of Guwahati, Assam. Grameen Sahara creates sustainable livelihoods by setting up companies, like the Golden Weavers Project, aimed at supporting local weavers and spinners. Or System of Rice Intensification, which aims to increase productivity for farmers, and Mahila Kisan Sashaktikaran Pariyojana, which empowers 3,000 women in agriculture. I worked with the CEO of Grameen Sahara, three project managers and the people responsible for Finance and HR. I was impressed by their eagerness to learn, the enthusiasm and orientation to action, as well as by their passionate devotion for their work for the communities. In the two day workshop it really felt like we were working together on designing a new organizational structure and HR Policy for Grameen Sahara. The second destination was Tonk, a small village in Rajasthan, where we worked with Maitree, one of the programs of SRIJAN. On the way to Tonk I enjoyed the landscape and the decorated and heavily loaded lorry trucks. Maitree is a dairy company which supports poor dairy producers in villages in increasing milk production and milk quality. Encouragement is given to create Village Development Committees that oversee milk production, resolve issues and advice the producers. The Pashu Sakhi’s, local women with a lot of knowledge on health for livestock, form the General Body of Maitree. They play an important role in the local community as well as in the Maitree organization. Some Pashu Sakhi’s participated in first part of workshop. Their strength and fierce avocation for increasing the role of women in decision making struck me in a very positive way. At Maitree’s workshop the CEO, marketing – and project executives were present. They too were easy to work with, enthusiastic and had a hands-on mentality that I found very stimulating. It was a great learning experience for me also. It stimulated me to be open to what was happening, to be flexible and adapt what I had prepared to the needs at hand. I admire the passionate devotion to their work of all I worked with. Sometimes the work sacrifices their personal life. This made me very much aware of the good live we have in the western world, which we often take for granted. Last, but certainly not least, I very much enjoyed working with Supriya, learning from her dedication and stamina to create lasting value and maximize the outcome of the workshops. It was a pleasure to travel with her, talk to her and work with her. I hope I will be able to do more work for Women on Wings in the future!